Archos makes several popular portable media players. The video file format is Windows Media Video ( *.wmv ). The video compressor Windows Media Video 8 offers a near-DVD-quality video at low bitrates. The Frame Rate is set at 25 Fps and Bitrate is 1000 Kbps. You can preserve, change or set your own video dimensions. The audio compressor Windows Media Audio 8 nearly triples the digital music storage on portable devices, PC, and DVD players. The frequency is set at 44100 Hz and bitrate is 128 Kbps. The Stereo audio channel creates an impression of sound heard from various directions. The Archos Audio profile creates MP3 files. For MP3 files, the audio compressor used is MP3 (MPEG 1 Layer 3). 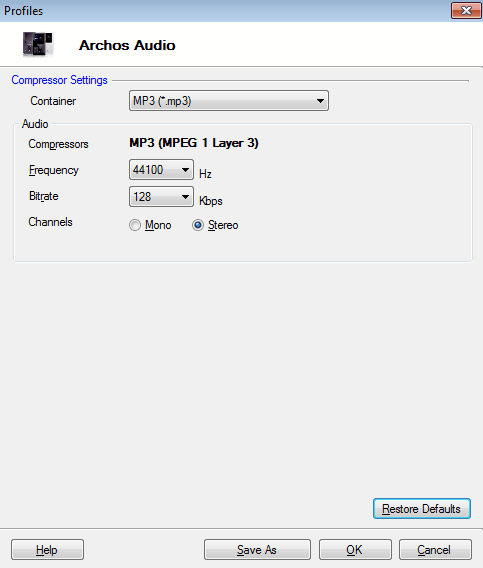 Archos uses the MP3 ( MPEG 1 Layer 3 ) compressor for MP3 format. You can change the format to Advanced Audio Codec ( *.AAC ) from the drop-down menu. The Advanced Audio Codec ( *.AAC ) files are generally higher quality and slightly smaller than MP3 ( MPEG 1 Layer 3 ) files at similar bit rates. The advantage of MP3 is that it is more widely supported than AAC. The Frequency is set at 44100 Hz and the Bitrate is 128 Kbps. You have the option to select either Mono or Stereo (default) as the audio channels. 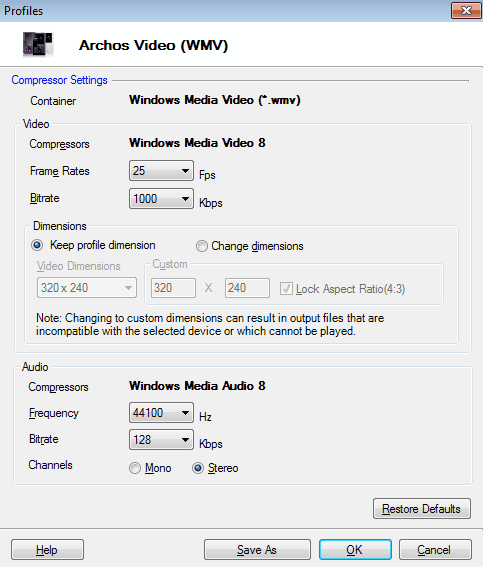 Archos 105: The Archos 105 profile creates WMV files and uses standard Windows Media compression for both video and audio. Archos 405 and 605 wifi: The profile for these devices creates AVI files. You can choose between the Xvid Encoder compressor and the MPEG-4 Compressor. Generally, there is no reason to switch from the default Xvid. This profile uses MP3 audio compression. Archos 405/605 wifi with Add-ons: This is the same as the above profile, except that it uses the H.264 video compression method and AAC audio compression. This profile produces smaller files than the Archos 405 and 605 wifi profile with the same audio and video quality. AAC audio compressor allows better compression without reducing quality. However, your device can play these files if you have purchased and installed the MPEG 4 add-on from Archos. Archos 705 wifi, 5 and 7: The profile for these devices creates AVI files. The default compression method is H.264. You can select between the Intel(R) H.264 (AVC) compressor and the XviD Encoder. H.264 produces smaller files but requires more computer resources. If your computer slows down noticeably when ripping using H.264, switch to the Xvid compressor. This profile uses MP3 audio compression.